This detailed and busy map covers the southern part of Birmingham, including much of Balsall Heath and the western part of Sparkbrook. Coverage stretches from Gough Road eastward to Sampson Road and from Wrentham Street southward to Edward Road. It is primarily an area of crowded streets of housing (mostly terraces or back-to-backs) with many small workshops. Other features include Calthorpe Park, Bristol Road with larger houses, tramways and depot, Midland Railway with Camp Hill station, Camp Hill Goods station, Holy Trinity church, Grammar School, Highgate Park, St Luke's church, Belgrave Works, Church of St Mary & St Ambrose, River Rea, St Alban's church, etc. On the reverse we include street directory entries for Balsall Heath Road, Belgrave Road, Bell Barn Road, Darwin Street, Edward Road, Highgate Street, Leopold Street, Sherbourne Road, Sun Street. Warwickshire Sheet 14.05 Central Birmingham 1902-11 - published 1989, revised 2001; introduction by Richard Abbott This detailed and busy map cover..
Warwickshire Sheet 14.10 Small Heath & Sparkbrook 1903 - published 2000; introduction by Richard Abbott This detailed map covers the Small Heat.. 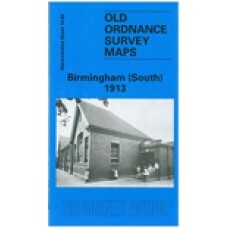 Here are the details of maps for central Birmingham: Warks Sheet 14.05a Central Birmingham 1888 - published 2011; intro by Barrie Trinder. ISBN.978.. Here are the details of maps for central Birmingham:Warwicks Sheet 14.05a Central Birmingham 1888 - published 2011; intro by Barrie Trinder. ISBN.978-.. Here are the details of maps for Small Heath:Warwickshire Sheet 14.10a Small Heath & Sparkbrook 1888 - published 2016; intro by Barrie Trinder. IS..